Some 20,000 visitors made their way to the Malaysia Property Exhibition (Mapex) 2014 at the Subterranean Penang International Convention and Exhibition Centre (SPICE) in Relau, Penang, in search of their dream home. From landed properties to high-rise units, the Mapex City 2014 showcased projects by reliable developers with prices which ranged from RM346,000 to RM15mil. Event organising chairman Ng Chin-U said the three-day exhibition held from last Friday to Sunday saw developers generating RM48mil worth of sales. It was the second Mapex this year. The first, which was held during Chinese New Year in February at the G Hotel Penang, saw about 30,000 visitors and a total sales of RM130mil recorded. Ng said buyers might be adopting the wait-and-see approach as the Budget 2015 was just around the corner. “The cooling-off measures on the property market may be one of the factors as well, as generally buyers are more careful,” he said. Cooling-off measures include 70% loan policy for third property purchases, requiring the housing loan limits calculated based on net income instead of gross and loan tenure reduced from 45 years to 35 years. Ng added that those who missed the exhibition this time around could look forward to next year’s Mapex, which is scheduled to be held during Chinese New Year in February. 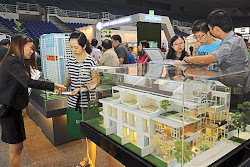 Organised by the Real Estate and Housing Developers’ Association (Rehda) and Henry Butcher Malaysia (Penang), the exhibition was participated by a total of 16 exhibitors who took up 30 booths. Penang Chief Minister Lim Guan Eng who opened the exhibition on Saturday, urged Bank Negara to reinstate the developers interest-bearing scheme (DIBS) for first-time buyers as well as increase and extend the scheme by Syarikat Jaminan Kredit Perumahan (SJKP) to buyers of affordable homes costing from RM72,500 up to RM400,000. “Ever since DIBS was abolished, many first-time buyers of affordable housing could not obtain bank loans to buy their own homes. “Up to 70% of the housing loan applications for low-cost and low medium-cost homes have been rejected by private banks,” he said. He added that legal fees should be part of the DIBS package and stamp duty should be waived to lower the initial entry cost for first-time home buyers. Rehda Penang chairman Datuk Jerry Chan said the exhibition was largely focused on Penang properties. He said Rehda Penang had been trying to help first-time house buyers. Besides that, Chan said that during the recent Mapex, organisers donated RM50,000 to six charitable organisations namely DHome Mental Health Association, The Salvation Army Penang Children’s Home, Grace Harmony Home, Children Protection Society , Penang Cheshire Home and St Nicholas Home Penang. Also present during the opening were state Housing, Town and Country Planning Committee chairman Jagdeep Singh Deo, state Agriculture and Agro-based Industry, Rural Development and Health Committee chairman Dr Afif Bahardin, state Religious Affairs Committee chairman Datuk Abdul Malik Abul Kassim and state Tourism Committee chairman Danny Law. The developers who took part in the exhibition were Eco World Development Sdn Bhd, SP Setia Bhd Group, IJM Properties Sdn Bhd, Asas Mutiara Sdn Bhd, Chong Company Sdn Bhd, Sunway Grand Sdn Bhd, BSG Property, Ivory Properties Group Bhd, Ideal Property Group, Airmas Group, Tambun Indah Land Bhd, Tropicana Macalister Avenue (Penang) Sdn Bhd, MTT Properties & Development Sdn Bhd, Palmex Industries Sdn Bhd, Inspirasi Elit Sdn Bhd and Plenitude Bayu Sdn Bhd.